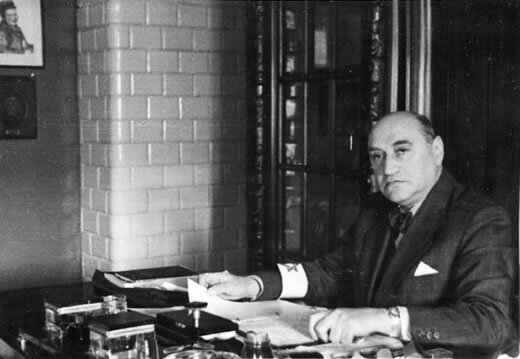 Photo : Adam Czerniakow, Chairman of the Warsaw Ghetto Jewish Council. 1942: On July 21 the Germans seized sixty Jews in the Warsaw ghetto, among them three members of the Jewish Council. At the same time, a number of Jews were shot in the streets, or in their homes. On the following day, July 22, a telegram was received at Treblinka station “informing us”, as the Polish railwayman Franciszek Zabecki recalled, “of the running of the shuttle service from Warsaw to Treblinka with settlers”. The trains would be made up of sixty covered goods wagons. After unloading, the trains were to be sent back to Warsaw. “Our astonishment was immense. We wondered what sort of settlers they were, where they were going to live and what they were going to do? We connected this news with the mysterious buildings in the forest”. That same day, July 22, the ghetto walls were surrounded by Ukrainian and Latvian guards, in SS uniforms, armed, and at twenty-five-yard intervals. The round-up and deportation of Jews from Warsaw now began. …. The deportations from Warsaw continued, almost without pause, until September 12. In those seven weeks, a total of 265,000 Jews were sent by train for “resettlement in the East” Their actual destination was Treblinka, and its three gas-chambers. Death, not slave labour, was their fate. It was the largest slaughter of a single community, Jewish or non-Jewish, in the Second World War. No one book, certainly no one chapter, can tell the story of those seven weeks, each day of which saw the murder of more than four thousand Jews. Merely to list the names of the murdered ones, a line for each name, would take nearly seven thousand printed pages. …. “When I asked for the number of days per week in which the operation would be carried out,” Czerniakow noted in his diary on July 23, “the number was seven days a week”. His diary entry continued: “It is three o’clock. So far, four thousand are ready to go.” “The orders are that there must be nine thousand by four o’clock. They demand from me to kill the children of my nation with my own hands,” Czerniakow noted in his diary, later that day. “There is nothing left for me but to die.” That day, Czerniakow committed suicide. Note: The Germans often used dates that were sacred on the Jewish calendar for particular measures against them. 22 July 1942 was Tisha B’Av, the ninth day of the Hebrew month of Av, the day Jews commemorate the destruction of the First Temple (by the Babylonians in 586 BCE), the Second Temple (by the Romans in 70 CE), and other destructions in their history. This year Tisha B’Av falls on August 1.